In this year’s Iditarod sled dog race there are 66 mushers and over one thousand dogs that will spread across 975 miles of trail in some of the most remote conditions in North America. How to they keep track of all these dogs? Starting as soon as the weather cools and the days get shorter an Iditarod musher is paying close attention to the future stars for the Iditarod team. Over the next few months, hundreds of training miles and countless hours will be spent with the dog teams trying to pick the ones that have the best chance of making it to Nome in early March. During the week before the Iditarod start, which takes place the first Saturday in March in Anchorage, the mushers bring their dogs to mandatory veterinarian checks. Most mushers will bring up to 20 dogs to this check-up, as even less than five days before the race starts the final team is not yet in place. At the vet check, as it is called, the dogs are put through a series of test including blood work, EKG’s, and a full exam. Special attention is paid to white blood cell counts and heart rates. If you think about it, your pet dog probably hasn’t been through an exhaustive exam such as this one. This is just one testament to the extraordinary care given to these sled dogs. Each Iditarod sled dog is required to have a microchip. These are the same chips that your pet dog may have. These chips are used a primary tracking mechanism for the sled dogs on the trail. On Saturday and/or Sunday before the ceremonial start in Anchorage and the re-start in Willow, an Iditarod official will come around to each dog truck, scan and verify against a list of dogs submitted by each musher. The number on the form must match the number of the chip. Up to 12 dogs can be ran in the 11-mile ceremonial start and up to 16 (no less than 12) can be used in the race itself. Hours before the race starts on Sunday, the musher must chose the final 16 dogs that will take him to Nome. Typically before the ceremonial start or the official start in Willow on the first Sunday in March, an Iditarod official will randomly chose up to eight dogs to provide a urine sample. The sample is checked for illegal drugs and supplements such as steroids in the dog’s urine. Random sampling can be conducted anywhere along the race as well. It is a sight to watch the Iditarod officials, mushers and their handlers trying to obtain the urine samples. For the male dogs, a zip-lock style bag is attached with an elastic band around the dog’s mid-section and covers the dog’s private parts. With fingers crossed a sample is provided when the male lifts his leg to do his business. For female dogs, the Iditarod official can be seen following the dog around, cup in hand, hoping to catch a sample when she takes a “break”. After collection, the samples are secured in a way very similar to the way a human U/A test is conducted and it is tracked by the dog’s microchip number and tag. Each Iditarod musher is given a set of tags—as seen in the picture above. These tags list the race year (this year it is ‘XL’ which is 40), the musher’s bib number and a corresponding letter for the dog. 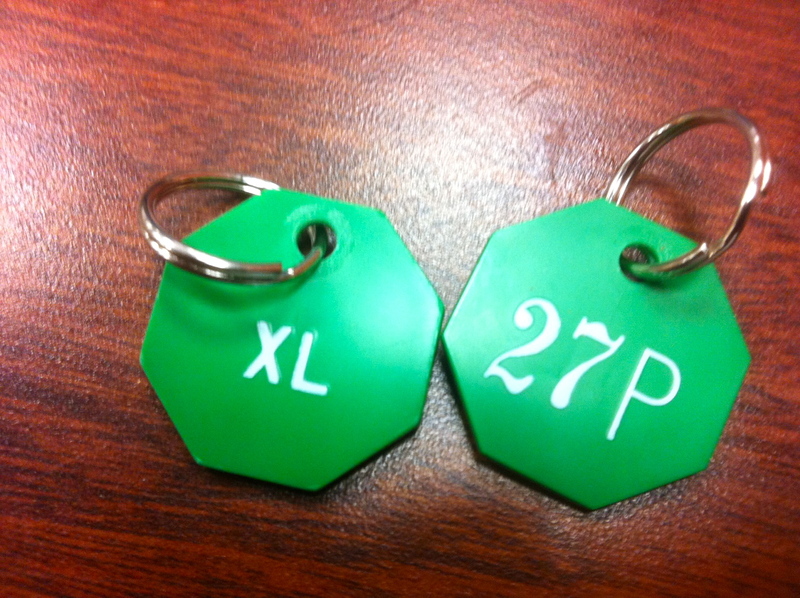 As shown in the picture–27P for Hugh Neff’s dog. These tags are placed on the dog’s collar and it will be used throughout the race as a way of identifying and tracking the dogs at checkpoints and if the dog is dropped in the race. A musher can drop a dog at any point in the race at any checkpoint. This is done for a variety of reasons. It could be an injury or illness or the dog just is not performing “right”. Some dogs are picked for the team for various reasons, one may be to be a part of the team over the tough first third of of the race and then they are dropped at the next checkpoint. While the dogs are in the checkpoints they are taken care of by a team of volunteers that care for them 24 hours a day. The dogs wait in the checkpoint until the Iditarod Air Force arrives to take them back to Anchorage. The Iditarod Air Force is an army of volunteer pilots that fly to and fro along the Iditarod trail during the race that ferry supplies, people and dropped dogs from place to place. Once a dog is on the plane he is heading to Anchorage. These dogs can arrive at all hours of the night and they are picked up by the handlers and taken to dog yards throughout the area or home if the musher lives close by. Those dropped dogs that are not picked up, usually for lack of sufficient support staff (or handlers) for the musher, they are taken to the women’s prison in Eagle River. The minimum custody facility’s dog yard, about 20 miles north of Anchorage, is staffed by offenders and correctional officers. The offenders take care of the dropped dogs until the musher returns after the race to pick them up. When a musher and his dog team cross the finish line under the burled arch in Nome the dogs are loaded up in crates and taken to Anchorage by airplane. These dogs are once again tracked by their tag and microchip. The crates are a relatively new addition to the Iditarod. In years past all of the dogs would be loaded up in large wooded boxes, similar to what you might see on a dog truck and flown the 1,000 mile trip south. As I mentioned, none of this would be possible without the handler army. These guys and gals who work for, married to, indebted to, or volunteered for, are some of the hardest working members of an Iditarod musher’s kennel. Many of the handlers are young college-aged “kids” that come to Alaska in search of adventure and spent the winters working in an Iditarod kennel. Most work for just room and board and the chance of running a dog team. Their duties include feeding the dogs, running the ‘B’ team, errands, etc. They are an integral part of the musher’s team. In regards to the dropped dogs–the handlers are responsible for picking them up when they arrive back in Anchorage. They are often taken back to the musher’s kennel or a host family during the race. This year I am Hugh Neff’s dropped dog person and all of his dogs will be staying at my place until he arrives after the race to pick them up. After the race is over a musher can’t wait to get back to his dogs. This reunion is one of the greatest things about dog sled racing. The dogs are so happy to see their “guy or gal” and the same for the musher to the dogs.